Our Exchange 2010 server (v14.03.0339.000, which is the latest version as of February 2017) works fine (one single exchange server in the AD), except for the search index. ContentIndexState is Healthy after being Crawling for a few minutes after a catalog reset. Although being Healthy, the size of the catalog folder in the file system of the mailbox is just about 400KB (I read that the catalog size is generally supposed to be about 5-10% of the database size, which would be about 5GB in my case). Perfmon shows 0 successfully indexed documents, while way beyond 200k documents are listed as failed. 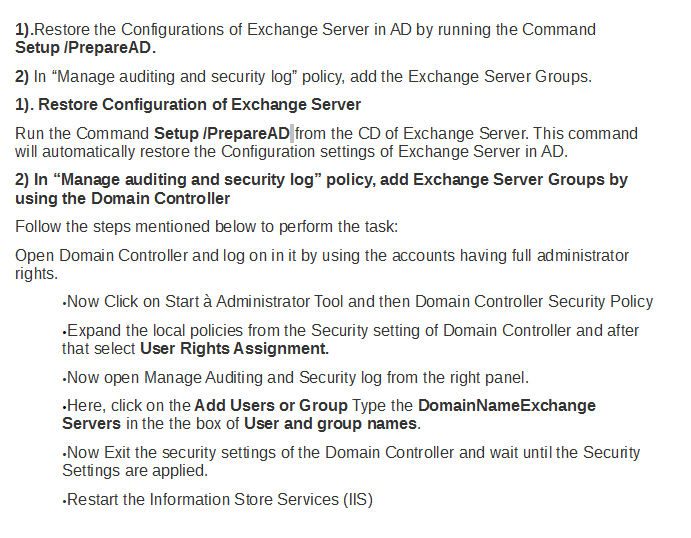 Running Repair-ExchangeSearchSymLinks.ps1 and rebuilding the catalog as suggested here: https://blogs.technet.microsoft.com/exchange/2011/06/30/after-installing-exchange-2010-service-pack-1-searching-via-owa-or-outlook-online-mode-fails/ didn't help either. Any ideas? Could 0x80004005 point towards an access denied issue? Update: Creating a new mailbox database, moving mailboxes there and indexing yields the same error. Furthermore, I have created a new user with a mailbox, same issue here. I tend to think that the cause must be global, maybe in Active Directory itself. Yes, issues are related to indexing in Exchange Server. Whenever Indexing issue arise in Exchange Event Code 9877 generated with specific id details, in your case Error code 0x80004005.